Midfielder Andy King wants promotion with Derby County after joining on loan until the end of the season. The 30-year-old has been a long-term Rams target and joins from Leicester City. “There was interest in the summer but for one reason or another it didn’t get done and again in January we’ve been trying to get it done - but I’m just delighted to be here now,” King told RamsTV. “The main thing was to get it over the line but we’ve managed to do that now. “With the promotion push Derby County have got going on, I want to help them get back in the Premier League as soon as possible. I think with the new manager and the squad of players they have here then we have a good chance. “The lads have started the season well, they are in the mix and hopefully with a good second half of the season then hopefully it will be our year. 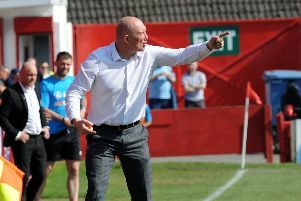 “I think they have done well considering the change of manager and style of play in the summer and sometimes it takes a season or two to get that right but the lads have adapted well and quickly. King will not be available for tonight’s game against Preston North End.